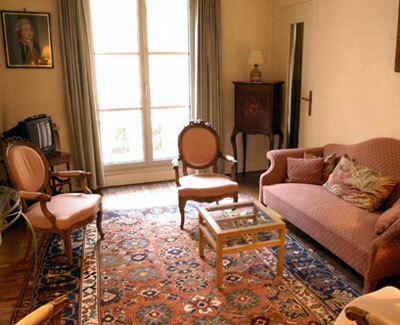 Just a short walk from the Seine, this apartment is in a fine listed Art Deco building with concierge, elevator. A comfortable base for visiting all the sites of Paris - RER/ metro lines direct to the Eiffel Tower, Invalides and Musee d'Orsay, as well as the Quartier Latin and Boulevard Saint Michel. Direct RER train also to Versailles (20 mins.!). One of Paris' most interesting parks on the banks of the Seine, Parc André Citroën, is 5 minutes walk - we will leave you to discover why we visit it so often! Attractive residential neighbourbood, with many little shops, cafés , restaurants. The apartment (approx. 75m2) is cosy and welcoming -overlooking wide open courtyard separating the two sister-buildings. Tastefully decorated and furnished with some fine antiques and good pictures, and carpeted throughout. Kitchen and bathroom, both good sized and well equipped are slightly dated in style (undoubtedly the latest thing in the 1960's!). In Parisian terms the cupboard storage space is lavish !